From May through October in 1917, the Virgin Mary appeared to three shepherd children in Fatima, Portugal. These incredible events were witnessed by tens of thousands of people. They are considered the most prophetic revelations of the 20th Century and the greatest miracle to have occurred on earth at the exact time predicted. Today, the message of Fatima is more relevant than ever before. 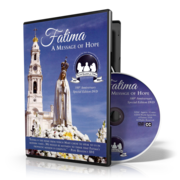 Fatima: A Message of Hope conveys this miraculous story with accuracy and passionate detail. Learn the truth of the events and the importance of Mary’s message through insightful interviews with experts such as Fr. Andrew Apostoli, C.F.R. ; Fr. Benedict Groeschel, C.F.R. ; Fr. Luis Kondor; Fr. Robert J. Fox; and family members of the three shepherd children.